Wildlife expert Khasru Chowdhury, who provided much of the information for this article, blames unplanned urbanisation for depletion of a rich reserve of wildlife from the city. Moreover, Khasru says, a lack of awareness among our generation about the benefits of a rich wildlife in our ecosystem has worked as a curse. In many countries there are official guidelines and laws for protecting urban wildlife but ignorance among citizens has turned our urban areas devoid of other lives, says Khasru. Only the other day lizards, jackals, wild cats and many other animals shared our neighborhoods. As the city grew at a phenomenal pace, none cared for the wildlife population. Over the years city's open spaces, parks, ponds, wetlands, residential and commercial plots were replaced by concrete structures resembling matchboxes. A child living in the city may never have the opportunity to experience a surprise of sighting a garden lizard or a jackal or even a frog. The following piece is a small effort to depict a picture about how the city treated its wildlife and where we stand today. In the month of April this year I was sitting on my dinghy at the confluence of the rivers Turag and Buriganga. The water looked black and it emitted a foul odour. Hundreds of tall chimneys in the brick kilns ceaselessly discharged black smokes. The sky was pale and the black smokes obscured the setting sun. Suddenly a sharp whoosh near my boat distracted my attention from the polluted atmosphere. Only ten feet away a Gangetic dolphin surfaced and surfaced again encircling the boat. It surfaced so near that I could make eye contact with it. Every time it surfaced the dolphin made a squeaking sound and gasped for air. Soon it became clear that the mammal was desperately looking for a respite from the polluted water. A dolphin can stay submerged for about half an hour during which it is able to extract some oxygen from the water. But the poor mammal was obviously denied his share of oxygen in the water. These Gangetic dolphins are accustomed to silted water but not to the toxic water of the Buriganga. The boatman and I felt helpless too. By now the sun had set and millions of mosquitoes hovered over us forming patches of black clouds. As we slowly rowed away from the spot the poor dolphin dived and surfaced with more frequency. The plight of the dolphin and its instinct to survive was permanently lodged in my mind. Early morning the following day I rushed back to the spot, buying on my way a kilogram of fish for it. It was bit too late. The pollution in the river water had already taken its toll. The poor mammal lay lifeless on the small beach nearby. Some children from the nearby Looterchar poked the body with twigs and drew a great deal of excitement from it. The city of Dhaka has probably many more similar tales to tell when it comes to its near extinct wildlife. The surging human population and an unabated unplanned urbanisation have apparently wiped out all kinds of wildlife from the city and its periphery. But wait. There are still survivors, who unlike the poor dolphin of the Buriganga are probably fighting a losing battle to survive the onslaught of human activities and make a niche in the concrete jungle. Rhesus Monkey: In many parts of the old city and in Mirpur area rhesus monkeys have made their presence felt. They are found on rooftops, electric poles, rain sheds and even on verandas of houses. They are city dwellers and they are there to stay. Local residents and animal lovers regularly feed the groups of monkeys that roam the old city. It is not clear how these monkeys have survived rapid growth in the old part, where old houses are fast being replaced by new box-like structures. But most of the urban monkeys still prefer to hang around the old houses which were built with the concept of adequate air, light and open spaces. Mongoose: In the city mongoose can be seen at Dhanmondi, Mohammadpur, Azimpur, Hazaribagh, Mirpur, Gulshan and in many other places. Mongooses are day-active mammals surviving in the city by feasting mainly on rat and insect population. In the city astray chickens sometimes fall prey to mongooses. Mongooses are also seen near the waste bins where they have learnt to extract leftovers for survival. But again unplanned urbanisation and the population boom are wiping out the city mongoose population. Jackal: Once free roaming in the city, jackals are now almost extinct. But still, sightings of jackals and their howling are frequent in areas like Mirpur Ceramic factory in the city. On the BDR headquarters premises and in its adjoining areas there were reported sightings too. In the past there were two types of jackals --- golden jackal (pati shial) and fox (khenk shial). The smaller foxes have been completely wiped out but some golden jackals are still surviving in mangy state. Bats: Up to four types of bats are found in the city. James Taylor a British Surgeon in the late 1800s mentioned in his book "Topography of Dhaka" sighting of a rare bat known as painted bat. Painted bat, most colourful flying mammal, is now extinct from the country. But presently small colonies of fruit bats and pipistrelle (chamchika) exist at different parts of the city. While bat colonies are seen hanging from branches of large trees in Ramna Park, National Botanical Garden and some others areas of the city, pipistrelle colonies choose to live in the loopholes of old buildings. Monitor lizard: In the recent past two types of lizards--- water monitor (gui shap) and yellow monitor ---were commonly sighted along the river Buriganga, Turag and Balu. Now the yellow monitor is extinct in the urban areas. Some water monitors are now counting their days. They can be sighted in Mirpur botanical garden and zoo areas. Water monitors survive on snake eggs, poultry, rats and carrion. Squirrel: Both Irawadi and five-stripe squirrels were once household names in the city. Now squirrels can be seen at Ramna Park, Suhrawardy Udyan, botanical garden and also at the zoo. Squirrels survive on fruits and nuts. Tokey lizard: (takkhak shap) Almost extinct but its enchanting calls can still be heard in Gulshan, Banani, Baridhara, Curzon Hall area, botanical garden and Dhaka Zoo. In Bangla we have wrongly classified it as a snake but actually it is a harmless lizard that lives on insects. Snakes: Chequered Keel Backs (Dhora shap), two species of cobras, vine snakes (shutanoli), wolf snake (ghor ginni), golden tree snake (kal nagini) and many other types of snakes were quite common in the city and its periphery. Still in the marshy areas of Khilgaon, Adabar, Rayerbazar and Mirpur Chequered Keel Backs are often sighted. Other reptiles like skinks and agamids are on the verge of extinction. Shrew and rats: Shrews and rats are the only mammals that have secured their places in the densely populated urban areas. These rodents are in fact thriving in the city. The shrew and rat population feed on all sorts of wastes. Garden Lizard (rokto chosha): Only a few years ago garden lizards roamed every neighborhood of the city. 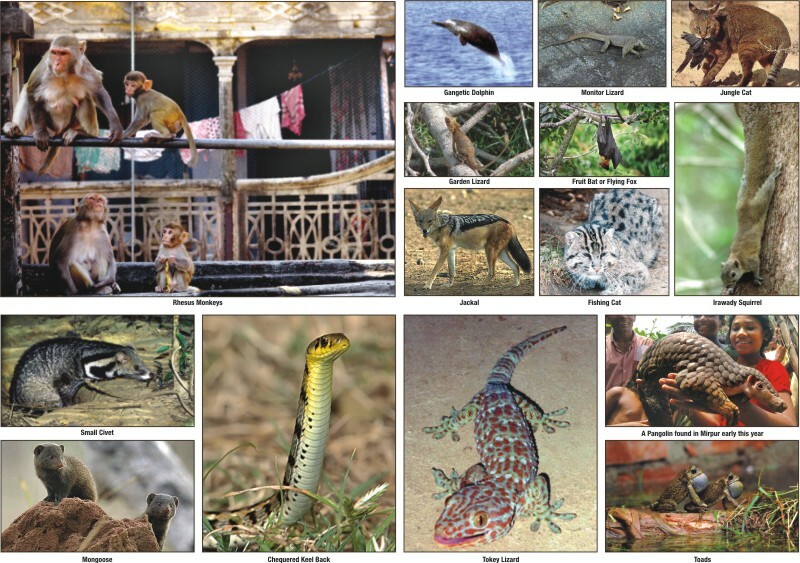 Although these insect eating creatures are now on the verge of extinction, garden lizards can still be spotted in Gulshan, Badda, Mirpur, Dhanmondi and Cantonment areas. Pangolin (bonrui): Pangolin a scaly anteater, feeding on termites and grubs has become almost extinct in the city. But on occasions they are caught near water bodies in the city's Mirpur and Joarsahara areas. Pangolins are a sought after creature for quacks. Frogs and Toads: Just after a rainfall croaking of frogs can still be heard all over the city. There are at least four types of frogs in the city. Skipper frog and tree frogs are however almost extinct but bullfrogs and toads are spotted occasionally. Cats: Fishing cat (mechho bagh) and jungle cat (bon biral) were spotted in our city and its periphery even in the 1980s. But none of these felines exists any more. Small Civets (khatash) and Palm Civets (bham): Like cats these strong smelling animals have become extinct from the city. Only a few years ago they were regularly sighted in the city's peripheral localities. Geko (tiktiki): According to wildlife experts, house lizards, one of the most common animals sharing our homes, are on the wane due to extensive use of insecticides at our homes.